This year SBA is publishing the Executive Applications. Please see below for the Candidate, their year, and the position that they are running for. Below is their candidate statements. Hi, I am Nuri Aujla and I am running to be the SBA President. I have had the pleasure of serving as Secretary this past year and helping SBA make several improvements. Serving on the Executive Board and understanding how the organization functions at the executive level will help me create a more effective SBA. I have been directly involved with planning social events such as, Monster’s and Barrister’s Ball. If elected President, I will work towards making these events more affordable for students and SBA members. As Secretary, I oversaw the membership committee, which sold the most amount of SBA memberships compared to previous years. However, there are still changes that could be made such as making the membership fees more affordable, and providing more incentives such as networking events and potential discounts. SBA worked closely with Career Services to host networking events, and worked with Deans Kuo and Miller to start the NAC Speaker Series. As President, I will continue to partner with Career Services and Faculty Members in order to host more events. I was actively involved in the Student Organization Finance Committee, ensuring that each student organization received appropriate funding for their events. This is something that I would continue to improve on by making the process to request money easier for the organizations. I am confident that I will be a great President because I will prioritize SBA and the student body as a whole. Additionally, I am extremely passionate about inclusion so if elected President, I will solidify a relationship with all the student organizations, and each student personally. Transparency is necessary, and I will work on making SBA more transparent to the student body by dedicating my time to having personal meetings with each organization to find out what I can do to help them. It is essential that students are able to use SBA as a platform for their causes. I have been a resource already for the student body by taking the initiative to reintroduce the SBA Monthly newsletter and revamp the SBA website, which detail a calendar of the upcoming school events, club meetings, law school information, suggestions and student accomplishments. My dedication to the newsletter and website showcases how I have taken steps to give students a voice in our law school. Beyond SBA, I also serve as a Peer Mentor. I have the experience necessary to serve as President and I am already extremely engaged with the student body and faculty. I truly believe that each student should have the opportunity to voice their opinions when it comes to SBA matters, and if elected to represent the student body, that is something I will ensure happens. I want each student to feel like a part of the U of SC Law community and I will do everything in my power to accomplish this goal. My Name is Christian Greene, and I am running for SBA President. I am running because I believe that SBA needs to change to become a better student organization for the whole student body. In order to accomplish this, SBA need to be an organization that works with every student organization to help them achieve their goals. This means working with organizations to have students and faculty come to their events; helping provide adequate funding for their event; and helping facilitate collaboration between other student organizations. Additionally, SBA should continue working with Career Services to take advantage of the great legal community we have in Columbia and bring more networking events for students to meet with lawyers and judges within our legal community. Lastly, I have learned there are internal infrastructure issues that SBA must address in order to fulfill its purpose within the law school. After serving as Treasurer for a year, I have seen first-hand how SBA should change to achieve these goals. These changes include making the process in which student organizations request funding more streamlined and quicker so that the organization can know what funding it receives. The other change is to have successful meetings where the presidents of the various organizations can get together to discuss how to help each other. I believe that I am the best candidate to see these changes happen, and it is why I am asking for your vote on Tuesday, March 26. Hey Y’all, I have served the past two years on SBA as a legislative member and now have the pleasure to run for SBA President. As you know SBA is a membership organization with the goal of fostering relationships with our Students and Faculty. I plan to grow our sense of community by increasing Transparency between SBA Members and Students by working with Students to make Membership not only affordable as well as provide benefits in which every student can access. As President, I hope to increase transparency through providing a platform, which allows students to give feedback and ideas. Though we have a suggestion box already set up, I want to individually meet with the various groups at our school to find out what we can do for them. I want to be able for our students to have a say in what they want not only from events, ticketing, and a membership-pricing standpoint. But as well as from a networking standpoint, holding us accountable and letting us know what works and what doesn’t as we go along. I also plan on using my experience in the USC Senate to work with our Law School senators to find a way to allocate more Student funds to the Law School, so we can continue the success we are building upon. At USC Law I am a member of the Mock Trial Team, a member of Phi Delta Phi Honor Society, and a founding member of Carolina Conservancy. Which in college at USC, I was the Chaplain of my fraternity and served in several roles in Student Government including the USC Senate, and the executive council for the Student Body President. I have a strong personal belief about getting to know everyone on a personal level, and I hope throughout this process you can come up to me and discuss the issues at hand. I look forward to getting to know each and every single one of you. USC holds a special place in my heart – a baseball stadium was named after my great-grandfather, my grandpa and uncle played football for the Gamecocks, and my dad performed the alma mater at his doctoral graduation. I could not imagine a greater privilege than the opportunity to share my love for USC with my peers as SBA Vice President. I serve my peers in several capacities through SBA. I learned about the different student organizations as a Student Organizations Liaison, and I hope to improve the overall student experience by encouraging these organizations to work together. I was a Peer Mentor, and I truly enjoyed crafting the Peer Mentor Handbook and advising my mentees. I also currently serve as the Communications Editor for the South Carolina Journal of International Law and Business, Historian of Phi Delta Phi, and a Mock Trial Bar member. These roles let me observe how different kinds of people communicate and work together, and I learned to tailor my leadership to these different approaches to collaboration. More than anything, I believe that I am the right candidate for Vice President because I love that SBA brings people together. One of my lifelong aspirations is to make others feel welcomed, included, and appreciated. As Vice President, I hope to have the ability to show others the same kindness that so many people at USC Law have shown me throughout my legal education, and pass on the desire to share my love for people with my peers. Being a law student means something different to each of us. The title comes with different hopes and aspirations of our future will be, but what we all share is passion and dedication. Like many of us, I take law school very seriously while trying to make the most of this unique experience. I have tried my best to engrain myself in our school. I am an active member in several student organizations, a Peer Mentor, and a joint JD/IMBA student. Each experience has provided me with different knowledge and skills, but what ties almost everything in our law school together is SBA. I appreciate all that SBA has done for me these past few semesters; I have enjoyed the events, and recognize their importance in providing all of us with some much-needed fun. SBA not only has the capacity to do so much more, but should do more. With me as your SBA VP, I will ensure that SBA will be a reflection of our passions. I am not overburdened with countless other commitments and am able to fully dedicate myself to this position. SBA can work with each student organization, with the South Carolina legal community as a whole, and with each student to ensure that their dedication will be recognized. Our current SBA execs have started us down this path, and I know we can build upon their work. I want to be an integral part of getting SBA to reach its fullest potential. USC Law is a wonderful place, with a strong sense of community. The Student Bar Association plays a vital role in fostering that kind of environment. SBA has made tremendous strides over the past two years and I am optimistic that we can continue making progress toward our shared goals. That is why I am running for SBA Vice President. Serving as an elected official, in any capacity, requires leadership. I served 5 years in the United States Marine Corps. Over that time, I was put in various leadership roles, including as a Platoon Sergeant and a Combat Marksmanship Coach. These experiences taught me how to be an effective, responsive leader. Over the past two years, I have served as a representative on the SBA Legislative Council. In that time, I have served as the chair of the Student Organizations and Student Voice Committees. In these roles, I’ve listened to students’ concerns and have worked to bring tangible results to USC Law. I have also learned what is needed to build on the success of the past year. Through restructuring some internal processes, in addition to continuing to promote better outreach between students, organizations, and the community, we can continue to bring out the best in USC Law. My name is Chris Siercks and I’m running to be your SBA Vice President because I believe that I have the leadership, experience, and commitment to serve as your voice on the SBA Executive Council. Please vote for me on March 26th! My name is Lane Christopher, and I am running for Treasurer of the Student Bar Association. I have spent the better part of this year serving as a 1L legislative representative, learning the ins and outs of SBA and what it takes to pull off our workshops, meetings, and events. As treasurer, I believe I could lead SBA in assisting the other student organizations, increasing membership, and throwing the absolute best events. Managing the budget takes diligence and hard work, and I promise as SBA Treasurer I will work to keep the Student Bar Association an efficient and effective student government that serves us all. Stay in the right Lane! Hey everyone! I’m Andi Borhanian and I am running for the position of SBA Treasurer. My undergraduate degree is in Finance and I worked at a financial planning firm for a few years before starting law school. I would love to be able to put my financial knowledge and financial planning experience to work helping SBA budget more efficiently. If elected as SBA Treasurer, I promise to help ensure that SBA funds benefit the student body as effectively as they can. I hope to budget the funds that SBA receives to support more beneficial activities and events for the student body. Networking and social events are so important for law students to establish relationships both with attorneys and with each other and I will use savvy budget planning to help all of the law school student organizations put on more of these events. I also hope to make the SBA budget more transparent for the student body so that every law student can see how their SBA dues are spent and how it helps them and the UofSC Law community.Please don’t hesitate to stop and ask me any questions you may have about my platform or my goals for SBA if elected as Treasurer.Thank you so much for your support and I look forward to hopefully serving as your SBA Treasurer! I’m Matt Henderson and I’m running for SBA Secretary. Serving as a 1L Legislative representative, I had the pleasure of serving on the Social Organization Committee. While a liaison to multiple social organizations, I witnessed the struggle they faced drawing new members, and holding events in the law school. This opportunity allowed me to learn about their goals, and become engaged with the student body. I hope to help these organizations draw more members, particularly 1Ls, as well as host events that will attract the student body. Lastly, I hope to continue to help plan and budget for SBA’s fantastic social events, as well as advancing our goal of making SBA a better networking body. This entry was posted in SBA Elections, Uncategorized on March 17, 2019 by Sam Sanders. 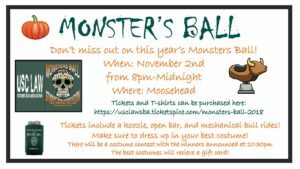 Tickets for Monster’s Ball and T-Shirts are up! It will take place on Friday, November 2nd at Moosehead in Five Points from 8-Midnight! Make sure to dress up in your best costume because there will be a costume contest with prizes for the top three winners! Tickets include a free koozie, open bar, and unlimited mechanical bull rides. 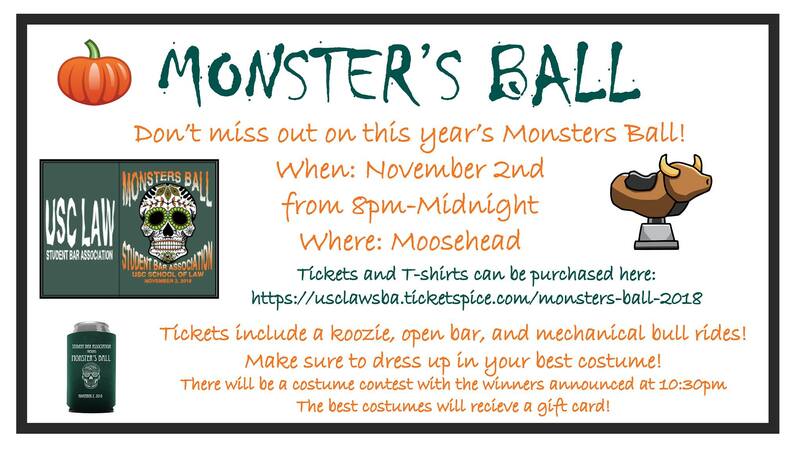 This entry was posted in SBA, SBA Monster's Ball on October 25, 2018 by Nuri Aujla. 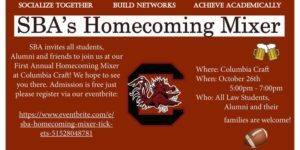 Please join the University of South Carolina School of Law Student Bar Association for our First Annual Homecoming Mixer! 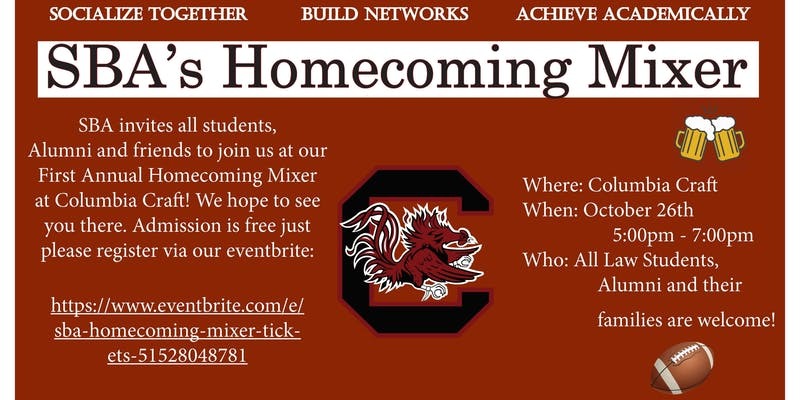 We will be hosting a Homecoming Event at Columbia Craft from 5:00 – 7:00 on October 26th. This event is free for all who attend. All law students, alumni, and family and friends are welcome! Please register as name tags will be provided for those who Register Thursday before 5:00pm; however, registration is not required to attend.The first 75 people who attend will receive a USC ❤️ the Gamecock button! In attendance will be the Richland County Bar and the Young Lawyers Division! *SBA will be providing the venue and gamecock spirit; however not food or drinks, Thanks! This entry was posted in SBA on October 25, 2018 by Nuri Aujla. Don’t forget to come out to the NAC Speaker Series today during lunch! 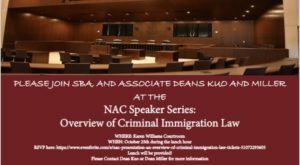 There will be an attorney speaking about the overview of Criminal Immigration Law. The monthly newsletter for October has been uploaded under the SBA Forms page! Also, don’t forget to buy your Band Party tickets! This entry was posted in SBA Band Party, SBA Membership Dues, SBA Monthly Newsletters on October 4, 2018 by Nuri Aujla. Check out SBA’s monthly newsletters! In the beginning of every month, we will upload a newsletter with any upcoming events, news on what SBA has been doing, and a SBA member of the month. Just click on SBA Forms and check it out every month! This entry was posted in SBA Monthly Newsletters on September 25, 2018 by Nuri Aujla. Don’t miss out on this year’s Band Party! It’ll take place at Swamp Cabbage on Friday, October 5th from 7pm-10pm. This is hosted on Parent’s weekend and is a family friendly event! Tickets include appetizers, craft beer and wine! Plus a beer specifically brewed for us, the SBA IPA! So come out, listen to the band, and enjoy some great food and drinks! This entry was posted in SBA Band Party, Social Events on September 25, 2018 by Nuri Aujla. On September 10th, the SBA Legislative Council met and voted on Amendments proposed to them by members of the SBA ByLaw Committee. These Amendments were just small improvements to the structure of SBA since the last amendments took place in 2004. Please read the proposed Amendments and vote if you would like them approved or denied. In order to amend the Constitution 1/6 of the student body must participate in the vote and it must pass by 2/3 of those that vote. Due to the Hurricane, the vote will open on Twen on September 14th at 4:00pm and will close on Tuesday, September 18th at 4:00pm. To vote, please log on to Twen and scroll to the bottom where your courses are shown. Please click on the one that says “SBA Constitutional Amendment Voting.” Then please review the document under “Documents” then “Proposed Amendments” and click on “Approved SBA Constitutional Amendments.” To vote click on customized polling and answer the 1 question poll about your approval or denial of the Amendments. Please participate and have your voice heard about these minor, but necessary improvements to the SBA Constitution. These amendments allow the SBA Legislature and Honor Council to function in a more efficient manner. In the documents portion on TWEN you will find the Old SBA Constitution, the amendments that were proposed to the Legislature, and the amendments that were approved by the Legislature. Please vote your approval or denial of the document titled “Approved SBA Constitutional Amendments”. If you have any questions please do not hesitate to contact Alex Mende, Cleburne Fant, or Sam Sanders. Interested in running for an SBA Legislative Spot or an SBA Election Honor Council Spot? Please have attended a candidate forum or have met with Richard Capps or Carson Sadro & turn in your application by Sunday, September 9th at 5:00pm. All Candidates will be emailed by Monday, September 10th at noon for confirmation of your participation and Campaigning will begin on September 11th at 9:00am. There will be a Mandatory Candidate forum on September 17th at 12:40 in room 103, lunch will be provided. At the Candidate forum all candidates will speak on their behalf, and allow the student body to get to know them a little better. The election will take place via TWEN on September 18th from 9:00am – 7:00pm. Please go to the SBA Forms tab for the SBA Legislative Application! Thank you for your participation in SBA! This entry was posted in SBA Elections on September 6, 2018 by Nuri Aujla. Find all the information about purchasing your SBA Membership Dues through this link below! This entry was posted in SBA Membership Dues on September 6, 2018 by Nuri Aujla.